John Gloag (1896-1981) was one of the more substantial writers of science fiction in a Wellsian mode in the period between the wars. But he made more of a mark as a writer in architecture and design, and the history of furniture, and indeed did not start writing fiction until after he had published a book in Kegan Paul’s famous “To-day and To-morrow” series: Artifex, or the Future of Craftsmanship (1926), which discussed the relationship between artistic craftmanship and mass production. 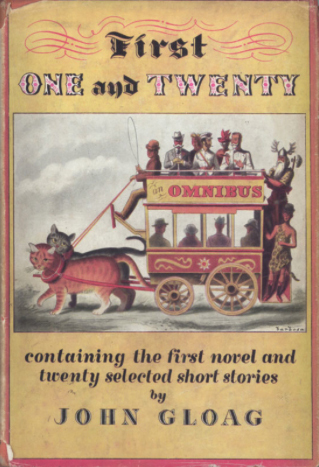 His first novel was To-morrow’s Yesterday (1932), which was strongly influenced by Wells, and by Gloag’s friend Olaf Stapledon: it was a satire which viewed humans from the standpoint of our successors: time-travelling cat people who were exploring conditions in 1932 and 1963. As the Encyclopedia of Science Fiction notes, his novels often involve satire, and usually concern themselves with the social effects of new discoveries. The New Pleasure (1933) imagines the effect of the artificial heightening of the sense of smell; Winter’s Youth (1934) imagines a rejuvenation process which brings social disorder in its train; Manna (1940) has a fungus that appeases hunger but which has unfortunate social side-effects; 99% (1944) is about an attempt to allow humans access to their racial memory; Slow (1954) is a about the misuse of atomic power. Gloag also wrote some historical fantasy, after a long gap in which he wrote no novels: his Roman Trilogy, concluding with Artorius Rex, was published in 1969, 1973 and 1977. I am not sure anything would be known about Gloag’s life had not Brian Stableford contacted him in the 1970s and asked him a series of questions. The results were published in “The Future Between the Wars: The Speculative Fiction of John Gloag”, Foundation: The Review of Science Fiction 20 (October 1980), 47-64 (reprinted in Stableford, Algebraic Fantasies and Realistic Romances (San Bernardino, CA: Borgo Press, 1995), 7-24. As it is, there is very little, and what there is can be mentioned under his War Experiences.